Classic active iris vasculature in retinopathy of prematurity is shown, as well as regression within 24 hours of off-label ranibizumab injection (0.25 mg) in both eyes. A 30-week-old, 1,570 g premature infant developed aggressive posterior retinopathy of prematurity and underwent treatment with off-label intravitreal injection of ranibizumab (0.25 mg) (Lucentis; Genentech, South San Francisco, CA) in both eyes because of fixed miotic pupils. 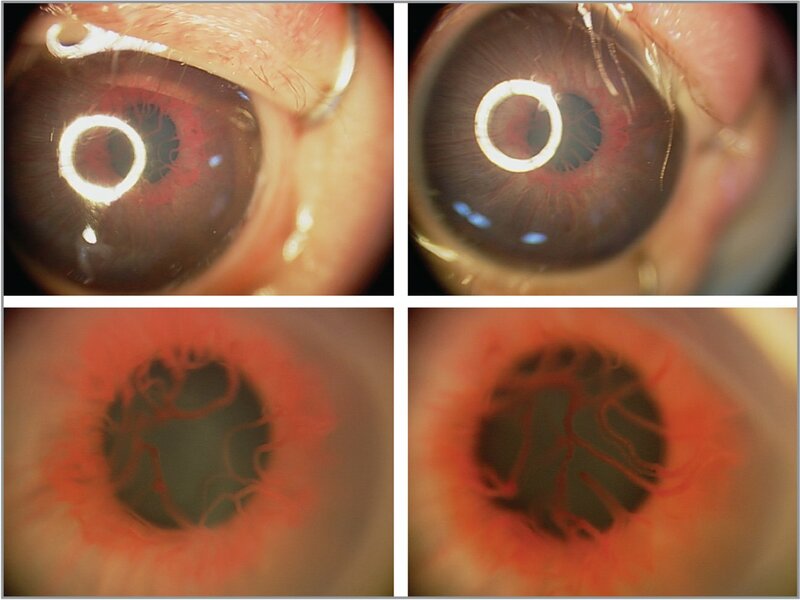 These images demonstrate two important findings: 1) classic advanced active iris vasculature (Figure 1, top, low magnification right and left eye, bottom, high magnification; Figure 2, iris angiography leakage) and regression within 24 hours following off-label ranibizumab therapy (Figure 3). The right eye responded well to therapy and the left eye progressed to retinal detachment. Top row demonstrates low-magnification views of the anterior chamber and iris of the right and left eyes. There is a thickened, elevated vascular network at the pupillary margin for 360°. Bottom row demonstrates high-magnification views of the same eyes demonstrating an exuberant, engorged iris neovascularization extending into the radial vessels. The pupil diameter in the bottom row is unchanged from the top row but appears larger due to smaller field of view. Iris fluorescein angiography of both eyes demonstrates the neovascular network (in dark relief) with surrounding fluorescein leakage. Same two eyes as Figure 1, 24 hours following off-label ranibizumab injection, the iris neovascularization has regressed and the pupils are now able to be dilated. From the Department of Ophthalmology, West China Hospital, Sichuan University, SIchuan, Chengdu, China. Dr. Fang reports no relevant financial disclosures. Address correspondence to Fang Lu, MD, Department of Ophthalmology, West China Hospital, Sichuan University, SIchuan, Chengdu, China; email: lufangscu@126.com.